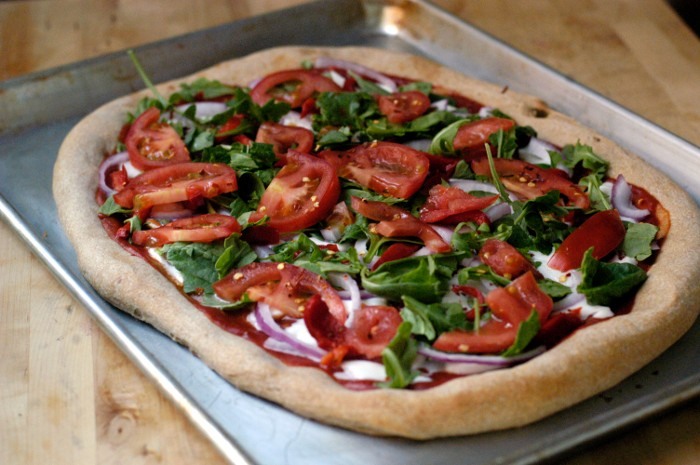 Everyone needs a staple pizza crust recipe! Our stand-by ingredients usually consist of the sauce, fresh mozzarella, tomatoes, spinach, onion and crushed red pepper. 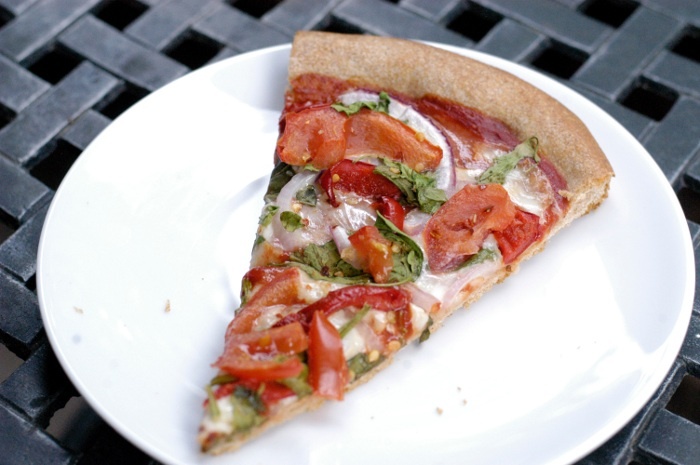 This slice also has roasted red pepper and fresh basil. Combine all ingredients well. Adjust the seasoning to taste. Makes about 2 cups sauce, which you can freeze in a baggie or tupperware for later use. I prefer to make the full recipe, using half all-purpose flour and half whole wheat flour. I always freeze half of the dough for another day. Adjust the racks in your oven so there is enough room for a large bowl to sit. Heat the oven to its lowest temperature. Before you begin mixing the dough, turn the oven off. This creates a warm — but not too hot — place for the dough to rise. Place the warm water in a medium bowl and sprinkle the yeast in. Let sit for about 5 minutes, or until foamy. Whisk in the sugar, olive oil and salt. Transfer the mixture to either a stand mixer fitted with the dough hook or a food processor fitted with the dough blade. You can also mix by hand with a wooden spoon. Add the flour a little at a time to the yeast mixture until the dough forms and is smooth, but do not overmix. Lightly oil a large bowl. Place the dough in the bowl and lightly oil the top of the dough. Cover with a kitchen towel and place in the warm oven to rise, about 1 hour. This is my pizza after the crust has baked for about 5 minutes, but the toppings are uncooked. My pizzas only take about 15 minutes after this point. 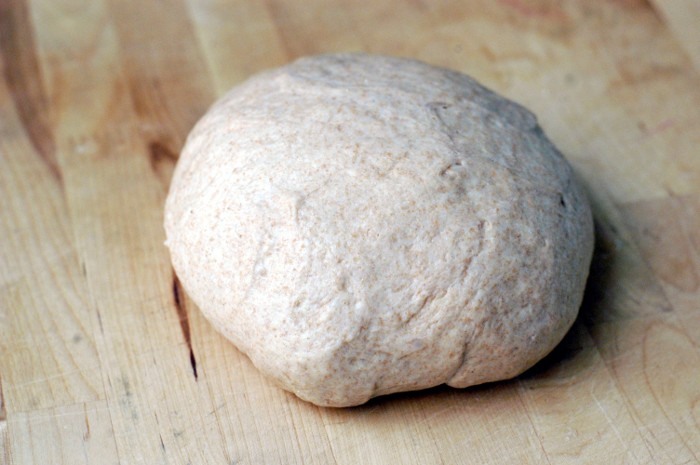 Once the dough has risen, turn it out onto a lightly floured surface. Knead just 2-3 times. Divide the dough in half. If only making one pizza, place on half into a large freezer bag. It can be stored for up to three months. Preheat the oven to 425 degrees. Lightly oil a baking sheet (or use your pizza stone, if you’re lucky enough to have that!). Gently press the dough into a large oval or rectangular shape slightly smaller than the baking sheet itself, about 17 inches by 12 inches. Brush with olive oil. I prefer to prebake the crust a little, about 5 minutes in the oven, but you can also immediately top the unbaked crust and bake everything at once! Bake the pizza, with toppings, for about 15-20 minutes, or until the crust is golden brown and the cheese has melted.